Marilyn SanClemente June 2, 2015 June 2, 2015 Specials, Stampin' Up! 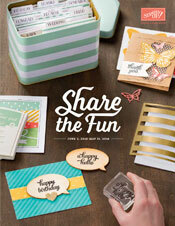 The NEW Catalog is LIVE Today!! and for today only – the new catalog and the old catalog overlap! So what does that mean for you?? Well – that means that today is LAST DAY to order any old/retiring product and place an order for new product!! Stampin’ Up! has never done this before!! You can place orders HERE on my website. I love to share the hostess benefits with my customers. If your order is under $150, then use the hostess code 9SXK96EK and I will send you a special gift from me. Of course if your order is over $150, take the hostess benefits for yourself!